15 cm of latex, wrapped in NZ quilted wool, and covered with a cotton and bamboo knit cover. Simple but appropriate materials make for an ideal mattress: latex foam supports body weight; wool for a fresh sleep atmosphere; knitted fabric stretches to contour shape. All natural, breathable and durable. Air circulates through the the whole mattress: latex, wool, cotton and bamboo. The breathable and insulating properties of latex and wool help regulate optimum sleep temperature. The quilted wool layer disperses humidity. This freshness is what helps the mattress feel warm in winter and refreshing in summer. Separately sleeved layers of weight supportive latex are at the heart of the Seraphic mattress design. The density of these latex layers is each available from very soft to extra firm. Find the right thickness and combination of latex layers. It's easy to choose your ideal mattress. Natural Beds provides a unique service: you can exchange layers of your latex mattress within a trial of 90 nights, for free, and we will cover postage. This means you can take out a layer and send it back to us, and we will send you a firmer or softer latex layer in return. You can do this with any layer, and swap it for any density. Swapping the top latex layer with one of a different density one can dramatically change the feel of the mattress. The density of the top layer provides the greatest influence on the feel of the mattress. In winter, many people prefer a softer, cosier bed and so move a softer layer to the top, and in summer they move a firmer layer to the top for a cooler, more refreshing sleep. If you don't like your ordered mattress, for whatever reason, tell us within 8 days of receiving it and we'll give you a full refund minus what you paid for delivery, we'll pay for the delivery back to us. If you like the mattress but want a thicker or thinner version, you have 15 days to swap it. Pay or get refunded the difference in mattress cost, and pay for delivery to your address. We'll pay for the delivery of the other mattress back to us. You can swap layers with us as many times as you need to within three months. Completely free. Latex is incredibly tough - retaining shape and springiness long term - and will not sag or loose supportiveness. We guarantee the mattress will perform optimally for 10 years. Seraphic 20 : Thick and luxurious. Three layers of latex, customisable from very soft to very firm. Seraphic 15 : Our most popular mattress in medium and firm preferences. If you are comfortable on any bed, can't decide, or don't know what to choose, then we usually suggest starting with a Seraphic 15 with medium density latex. We have designed the Seraphic 15 to best suit the widest range of people's preferences in regards to feel, thickness and support. 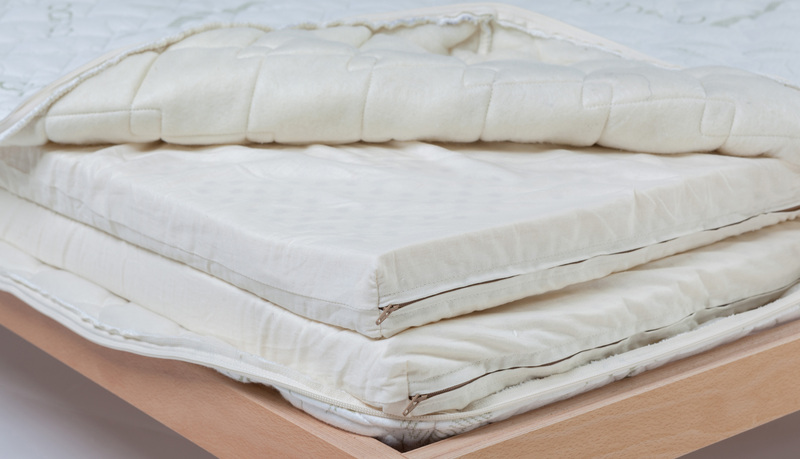 Latex layers can be exchanged at any time within three months to make the mattress softer or firmer. An alternative cover was available through Natural Beds until 2016: a bamboo and polyester three layer knit. We took this this fabric was 70% synthetic (polyester) and doesn't offer any advantages over the new organic cotton and bamboo three layer knit, so we took it off this website. The bamboo/poly fabric is still available from Futonz (our other brand). Do you need a non-standard size? We do not surcharge for special sizes and special orders still come with a 10-Year Warranty, however they are not entitled to a trial or exchange period.